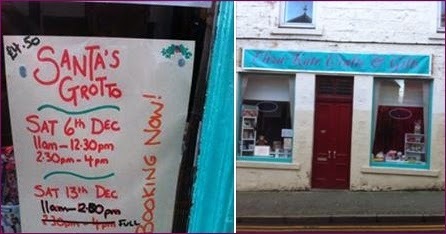 A Gurn from Nurn: Small business Saturday - why not visit Nairn High Street? Small business Saturday - why not visit Nairn High Street? It's small business Saturday so why not pop down to Nairn High Street or if you are passing through to the big city park up (it's free) for a while here and enjoy a stroll. The brae is looking quite interesting just now, Concept Gifts have reopened, there is a Santa's Grotto in the crafts shop further down (bookings 115 High St, 01667 451823 ) and you can also get County football related gifts at the town barbers.